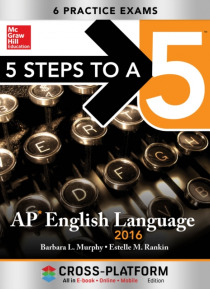 A 5-step program for success on the AP English Language exam. The unique Cross-Platform format enables you to study the entire program in print, online, or on a mobile device. 5 Steps to a 5: AP English Language will guide your preparation program and help you build the skills, knowledge, and test-taking confidence you need to succeed. This fully revised edition covers the latest course syllabus … and matches the latest exam. Features include: 6 complete practice AP English Language exams All the terms and concepts needed to get a top score 3 separate study plans to fit a test-taker's learning style About the Cross-Platform format: The Cross-Platform format provides a fully comprehensive print, online, and mobile program: Entire instructional content available in print and digital form Personalized study plan and daily goals Powerful analytics to assess test readiness Flashcards, games, and social media for additional support For the time-pressured AP student, this unparalleled digital access means that full study resources are always at hand.